Primer Solvent-based adhesive. It is to be applied to rough or porous surfaces before application of adhesive-backed products. One quart covers approximately 35 square feet. Size: 1-quart can. Roller Firm strong application roller used to compress anti-slip tape after final positioning. Koffler Kit comes with 1-quart can of Solvent-based adhesive and a handy roller for extra pressure application. Is there anything I can put on the soles of my Shoe? I work in a restaurant and they do make non slip shoes but they are ugly. 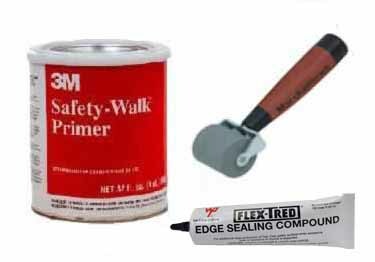 Anti-Slip Tape Roller and Primer for extra grip protection from 3M. Without a doubt the edge sealer is performing its job. Thank you very much. Easy to use and it's a very good product. Wouldn't purchase it from anyone else... Koffler Sales always has what we need and the product is always on point! Been using it on 6'ft tape with no issues, still like new! Thank you Koffler! Roller tool worked very well. No give at all even under heavy pressure. Made very well. Used on 60' of 6" tape and it survived and it still like new! Best People to deal with!! What a pleasure to deal with Koffler. Had the right product for my problem and the service was the best!! They made everything, from locating the product, to ordering and then delivering the product so easy and fast. Works GREAT IT is a MUST!!!!!! This kit works great with the anti-slip tape and seals all seams nice and tight. Fast delivery and great people to work with.